Jocelyn and Alex Garfinkel with their son at the new catering facility in Bridesburg. 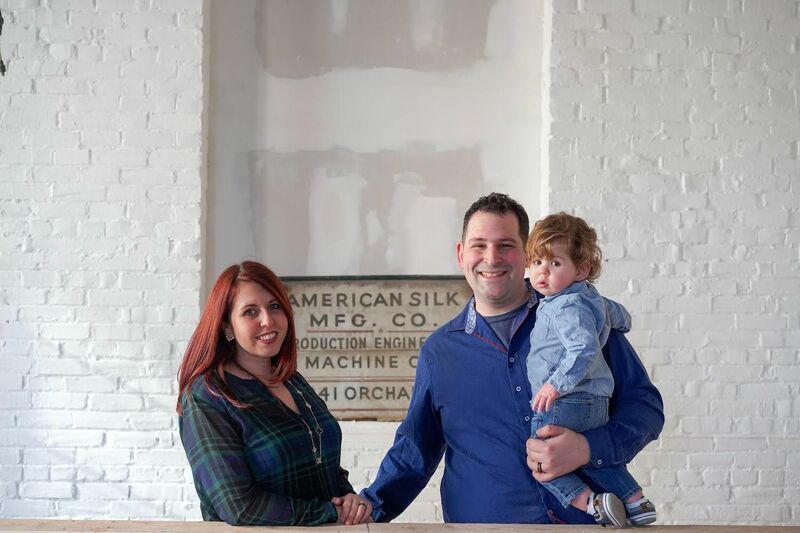 Balboa Catering’s Alex and Jocelyn Garfinkel, who run a popular series of dinners called Supper Club, are moving their operation from Fishtown into a renovated space at the former American Silk factory at 4325 Orchard St. in Frankford. The new space will be open for private events, cooking classes, and Supper Club dinners beginning in April. The building also features artist Steve Weber’s studio — Method Craft Design, LLC — on the first floor, as well as a studio for artists and filmmakers upstairs. Weber, along with woodworker Nathan Chase of Nathan from Maine, helped to design the space. In 2015, Garfinkel did the catering for the production of the movie Creed, serving lunch and breakfast for up to 100 people every day for nearly four months. Before the Creed contract, Garfinkel was running the business out of his parents’ house, and was able to move to Fishtown and rebrand the company thanks to the catering film’s catering job. It was the Creed production that led him to name his company Balboa Catering. A previous version of this article incorrectly located the neighborhood as Bridesburg.